As much as termites cause trouble worldwide, it was only a matter of time before someone would create a termite even a mother could love. Termites have been depicted in children’s cartoons as an adversary but this may be the first time that a termite carried the story. 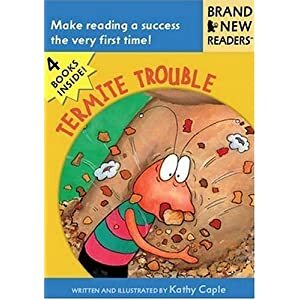 In “Termite Trouble”, Kathy Caple introduces her follow up character to the popular “Worm.” Termite has a voracious appetite that gets him into lots of trouble. He’s still a fun loving character that children can identify with. Termite was introduced by children’s author Kathy Caple in 2005 and followed by “Termite Tales” in 2009. Brand New Readers are geared towards children ages four and up. Reading success is important in young children; short books that introduce colorful characters are engaging and promote early reading skills. Parents report that these books are easy for children to read because they’re quirky and fun. They contain pictures that make it easy for children to guess at words they don’t already know; and there are guidelines for parents and teachers to help the children become successful. Introducing insects to children at a young age diminishes fears later in life. Even though we know as adults that termites are not cute, knowing their true nature helps alleviate phobias. Termite inspections in Arizona are often dreaded as much as the annual visit to the dentist. Grown-ups often think “What I don’t know can’t hurt me.” In the case of pest control, these thoughts can mean that termites get a hold on your home that could have been prevented. Introducing termites to children may encourage parents to think again about these tiny creatures. While Termites in books and cartoons are entertaining, termites in and around your home are not. Make sure your pest control professionals are licensed and trained in termite detection and prevention.